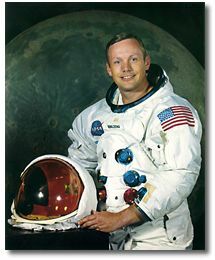 Astronauts, The US Space Program and My Trip to the Moon. This article is dedicated to the memory of Neil Armstrong and Sally Ride, both of whom passed into the great beyond this year. They both were incredibly brave American heroes. In 1969 Neil Armstrong was the first human to walk on the Moon and Sally Ride was the youngest person to travel into space and the first American woman in space. If you have ever been to the Kennedy Space Center in Cape Canaveral, Florida and have seen the space capsules up close and personal, you may begin to understand the amazing bravery of our astronauts. Most of us would not have the courage necessary to step inside and blast into the cosmos in what looked to me like a large metal can. One must immediately acknowledge the possibility of not returning to Earth alive, knowing the many perils that might beset the delicate capsule and trusting the ground crew implicitly. Yet they both volunteered without hesitation. 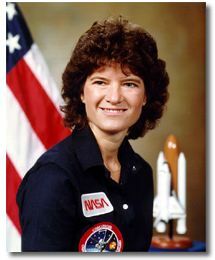 There are many articles on the internet about both Sally Ride and Neil Armstrong which I invite you to explore. I was an admirer of both and as a child wanted more than anything else to be an astronaut. One point I wish to explore currently is why the US apparently never has returned to the Moon after the Apollo 17 mission on Dec 7, 1972. I do not contend that I know the answer. The official story (which could be true) is that it proved too costly. There are two alternate theories which state that either the astronauts were warned off the Moon by aliens or that the US did indeed go back to the Moon and beyond but they did so as part of a deep black (ultra-secret) space program. The most interesting aspect of the latter theory is the information related by British hacker Garry Mc Kinnon about what he found on NASA websites. 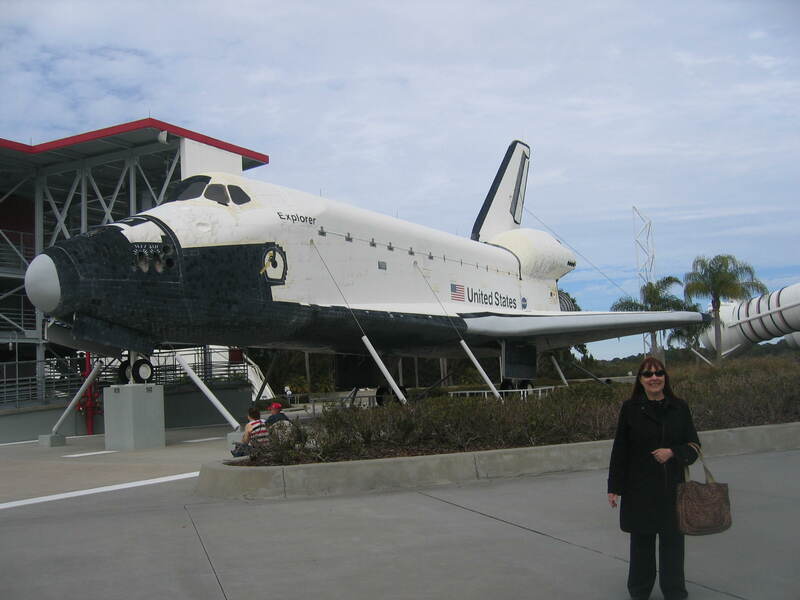 The blog author and NASA Space Shuttle at Kennedy Space Center. The Moon is a fascinating place for me and I have spent some time contemplating Moon mysteries. As a student of remote viewing (I find that the study of remote viewing enhances psi functioning. ), one of my strangest targets was given in a class I attended at the Omega Institute in 2002 taught by David Morehouse, a former government RVer. It was toward the end of a seven day course. As always, we in the class were blind to the target. In my viewing I went back to the summer of 1969 and Woodstock. In my current terrestrial life I am not very musically talented and only have learned to play finger cymbals, but I am always getting musical cues while remote viewing (go figure). So for this target I went back to the time of Woodstock through the music. To make a long story short the target turned out to be the first manned lunar landing which occurred during the same summer, the Woodstock Festival was August 15-18, 1969 and the lunar landing occurred on July 20, 1969. In remote viewing the target can be anywhere in time or space and in Morehouse’s class we had some targets from ancient times. I think it was notable since the entire history of humanity is a long time, that I was only about 3 weeks off in discerning the time of the target but I could not understand why I went so off course in terms of the place. Morehouse commented the following day that he had used the target in other classes and the results were always weird and odd. The Moon was full on the night our class attempted that remote viewing target. For some reason I took a photo of the full Moon after I left class that night. The target was not revealed until the following morning. Side note: Here is a link to the Kate Valentine UFO show in which I am interviewed about my remote viewing studies. Scroll down to Friday Nov. 30, 2012. 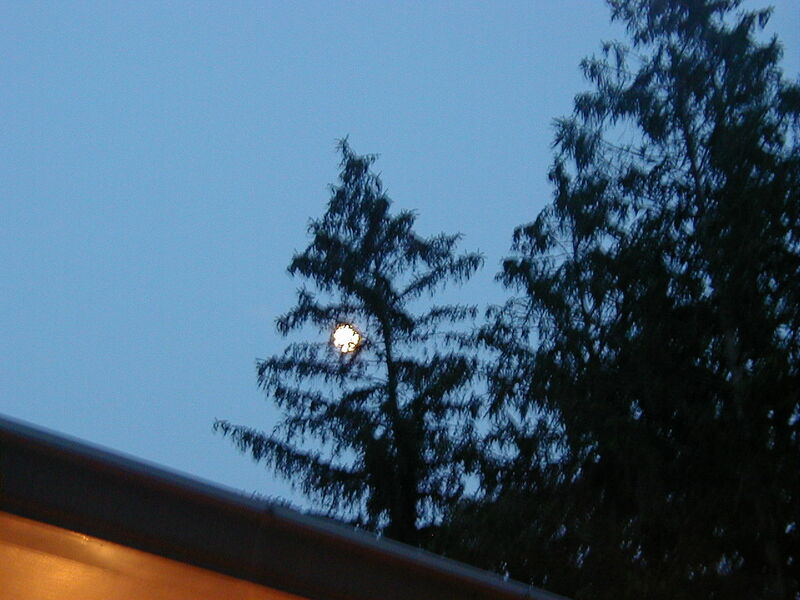 An actual picture taken by me the night of the lunar landing target at the Omega Institute in June 2003 but before the target was revealed the following morning. All rights reserved. A second interesting event involving the Moon occurred in my life surrounding the NASA bombing (LCROSS) of the Moon October 9, 2009, at 11:31 UTC (6:31 EST). Purportedly NASA was attempting to discover how much trace water was in the lunar soil for possible future lunar missions. A few weeks before the event occurred I was already quite upset with the idea of bombing the Moon. Hadn’t we humans already bombed our beautiful Earth enough? How do we know that the Moon is not a living entity like Gaia, our Earth? Now we had to start bombing other heavenly bodies? It seemed like a very bad idea to me. I set my alarm to wake early that morning and watch the bombing live on NASA TV on the internet. I was upset but as it turned out there was almost nothing to watch. The expected plume of Moon dust from the explosion never materialized, though some folks said the Moon rang like a bell. How they knew this I do not know. Having awoken earlier than usual to witness this explosion, I decided to go back to bed to meditate and ask forgiveness of the Moon on behalf of the creatures of the Earth. I went into an alpha state of awareness, mind awake, body still. And though I was aware of being physically in my bed, my mind travelled to the Moon. As I drifted above the chiaroscuro surface at a height of approximately 20-30 feet or so it seemed to me though there was nothing familiar on which to base that calculation. In the upper left corner of my vision I became aware of an object or assemblage of objects. As I began to focus on it, it looked like a disused piece of machinery resting in a “valley” area. Generally oblong in shape, it appeared to be metal, somewhat wrecked and in the shape of a very short train, though it was not a train. My “astral vision” was attempting to make sense of the object when suddenly I heard a voice behind me. It was a male voice with a soft Southern (US) accent. He or it said, “You have to leave here immediately, Ma’am. You have no clearance to be at this location.” Immediately I was back in my bed. I thought I was remote viewing the surface of the Moon, but now I think I went there astrally, because it seems I was detected. But by whom or what? The voice that startled me could have been that of a military intelligence officer or even stranger, something that wanted to sound like someone reasonably familiar to me. I was NOT asleep. I have not attempted to go back there, so frightening it was to me. Later that day or the following, I wrote a blog post about the experience. Around the beginning of 2012 I went back to reread what I had written, but it was no longer there nor were any of the drafts. All that remained of the post was a category that I created for it called “save the moon”. Who or what removed my post I doubt I’ll ever know. A very famous remote viewer named Ingo Swann has a published account of a visit he made to the Moon and I suggest that if you have interest in this topic that you read it. 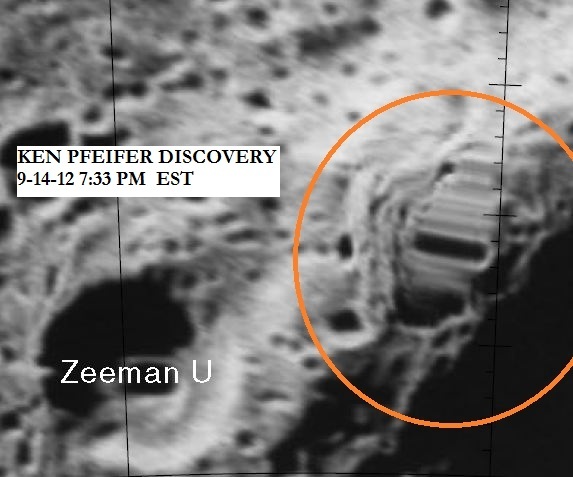 Ufologist Ken Pfeifer has been examining NASA photos of the moon for anomalies and I present one of his discoveries here. There are a number of others who study moon anomalies including Don Ecker, host of Dark Matters Radio Show and podcast. A number of astronauts have reported seeing anomalous moving objects while aloft or on the Moon but most have retracted their statements or become enigmatic on the subject. Astronaut Dr. Edgar Mitchell is most outspoken on the subject of aliens but does not say that he saw them while on the Moon.